Lydia has quite a lot of toys (far too many if you ask me), and also a lot of fluffy bears and other assorted stuffed animals. She doesn't have a very long attention span at the moment, so she will generally play with a toy for a brief few minutes before moving on to the next one. Each toy will be played with for a while, and then either be left on a table or the sofa, or simply be thrown away by Lydia (she has quite an arm on her, potential baseball player in the making). The exception to this rule, however, is her dolly Dorothé. This doll used to belong to Chris when she was a little girl. It is a basic plastic doll that closes her eyes when laid on her back. She has an unusual haircut, with her strands of dark hair cut short all over, making her look like a kind of brunette version of Yazz (brownie points to those who remember that one!). Lydia does not like Dorothé. In fact, it might be fair to say she hates her, and is terrified of her. Any other toy, Lydia will play with, but not Dorothé. You can ask Lydia to fetch any toy in the room and she will do it, but if you ask her to go get Dorothé she will look at the doll, shake her head and firmly say "no". If you move the doll closer to her, Lydia will try to back away, shaking her head all the while. I have managed to exploit this fear for our own good. I've been meaning to baby-proof one of our cupboards that contains our strong alcohol, as it is low down and the door easily opened by Lydia, but simply haven't got round to doing this yet. Lydia therefore regularly opens the door to have a look inside, meaning we have to keep stopping her and telling her off. A short while ago I stood Dorothé in front of the door with her head covering the handle, and Lydia hasn't even attempted to open it since. Problem solved! Recently Lydia had got into the habit of screaming and kicking whenever we attempt to dry her after a bath, which is very frustrating and often quite painful. 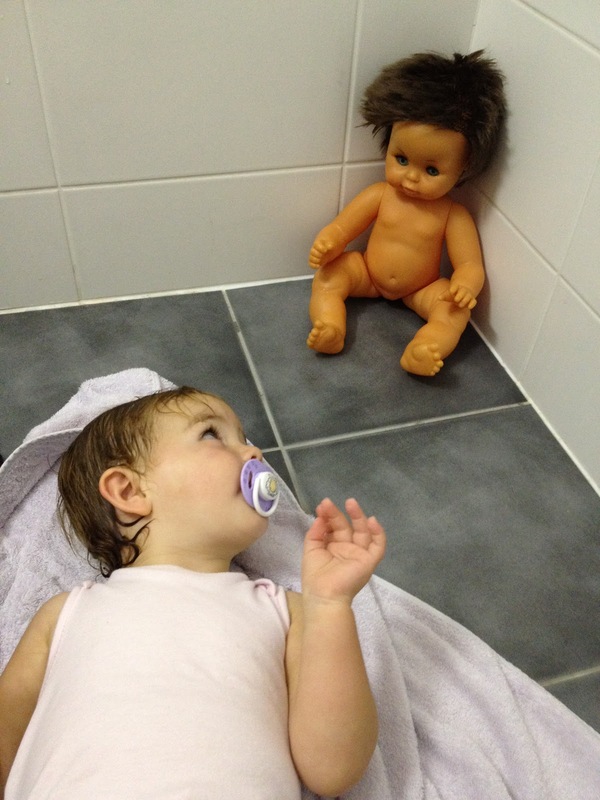 Chris had (for a reason I don't know) put Dorothé in the bathroom, sitting in the corner next to the bath. I gave Lydia a bath and afterwards took her out to dry her fully expecting the usual screaming fit, but was surprised to find her entirely calm in the presence of her nemesis. She laid still on the floor, all the while keeping her eyes on Dorothé, perhaps scared that she might try to get closer. Admittedly, I haven't repeated the Dorothé-bathroom trick as I think that might be going a bit too far (wouldn't want to traumatise Lydia, after all). She instead keeps her place in front of the alcohol cupboard, and is doing a pretty good job. 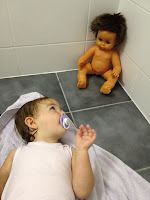 At least until the day when Lydia realises Dorothé is just a plastic doll... then I might have to install the baby safety lock on the cupboard.